The National Kidney Foundation states that over a half a million people visit their local emergency rooms each year because of kidney stones. These hard stones -- which can be as small as a grain of sand or large like a pebble -- are produced from chemicals that are found in urine. The most common stones are made from calcium. There are many reasons why people get kidney stones, including diet, obesity, family history and not drinking enough water. Stones can create a great deal of pain when they cause a blockage or become irritated. These stones can pass through urine by drinking large amounts of water, and in some cases surgery is required. There are a variety of herbal remedies that can help dissolve kidney stones and reduce the pain. Charles Kane, teacher and botanical writer of such books as “Herbal Medicine: Trends and Traditions,” states that burdock, which comes from the thistle family, may be helpful in dissolving kidney stones. 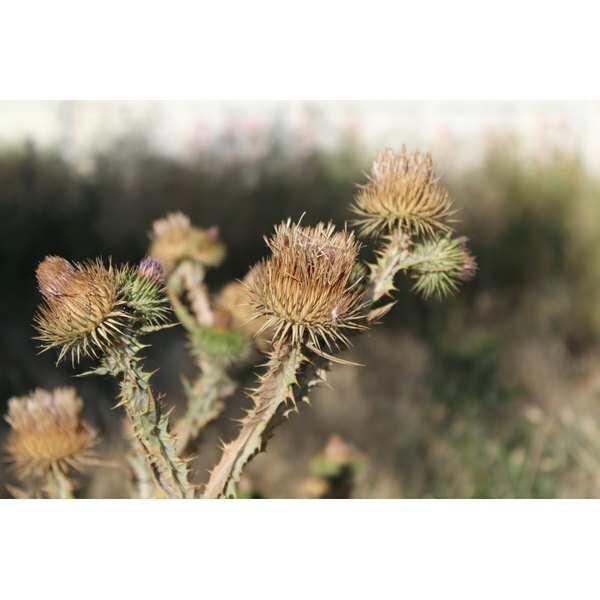 Burdock has been used for centuries to clear organs of stones. This is due to inulin ,which is one of the properties in burdock. This medicinal herb also acts as a diuretic, which helps excrete urine. Burdock can be taken in tinctures, capsules or infusions, and it is suggested to steep the fried herb three to four times daily in a cup of hot tea. In addition to helping dissolve kidney stones, burdock can also prevent stones from forming. Drinking uva ursi tea several times a day may help dissolve kidney stones. Certified nutritionist Phyllis Balch and author of the book “Prescription for Herbal Healing” suggests that the leaves of this small shrub-like plant may act as a diuretic that can help reduce uric acid, which is what some stones are made of. It also has a high levels arbutin, which increases urine flow and aids in alkalinizing the urine, which helps to dissolve the stone. It is suggested to avoid using ura ursi with citrus fruits, juices and vitamin C.
Dandelion root can aid in dissolving kidney stones, according to Michael Castleman, health writer and author of the book “Herbal Medicine.” Throughout time, dandelion has been considered a great way to keep internal organs clean and free of stones. This herb is also a diuretic, helping to the elimination of the stone through increased urination. Drinking hot dandelion every 15 to 20 minutes can offer relief. Drinking dandelion tea on a regular basis may also prevent kidney stones. Additionally, mixing dandelion with gravel root tea can soften the stone, making it easier to pass the stone. This mixture may also reduce the pain the stone can cause. Stinging nettles have been used to help with urinary infections and kidney ailments for centuries. Pharmacist, nutritionist, and bestselling author Dr. Earl Mindell states that stinging nettles can reduce inflammation of the bladder and helps break down kidney stones. Stinging nettles can be taken as a tincture, in capsules or used as a tea.